Luggage garment bag is ideal when you are travelling with formal attire and long garments, like suits and dresses. You pack your clothes flat but the bag folds over the center when closed, protecting your clothes from creasing. Most garment bags have hangers and separate compartments for shoes and other accessories, like toiletries. They can usually hold number of garments. Which explains why garment bags are popular among business travelers and others travelling with formal attire. Your travel needs should decide which garment bag to go for. If you want garment bag for your formal / business attire only then garment carrier (no wheels) might be sufficient. 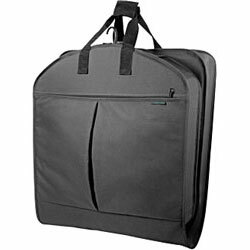 Wheeled garment bag would however be better choice if you want it to hold your other belongings as well, e.g. toiletries, shoes, business gadgets and working papers. You can now get wheeled garment bag that offers you similar luggage space as traditional carry-on bag, except your formal attire fits in better. Go for the best overall quality your budget allows, i.e. look for sturdy construction, durable material, good quality hangers, handles / straps, zippers, etc. If you are going for wheeled garment bag, you are likely to want it to be your main carry-on luggage as well, i.e. with enough space for other things you need to pack. If this is the case then make sure the internal organization fulfills your business / travel needs. Your formal attire should fit in nicely (make sure the length is adequate) but there should be separate compartments for your other personal belongings, like shoes, toiletries, etc. There should also be ample secure space for your travel gadgets, like laptop, phone, etc. It is important that you can easily access all electronic gadgets when going through airport security. It will save you valuable time and hassle. Most garment bag users travel frequently. If this is the case for you, then always go for the best quality you can find within your budget. 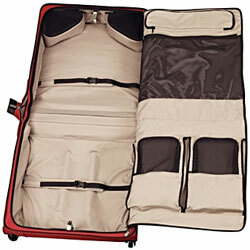 Look for a luggage Garment Bag that is easy to maneuver around busy airports, hotels and offices. This means quality set of wheels, easy-grip handle, strapping system that allows you to attach extra luggage if needed (e.g. separate laptop bag), quality material, strong zippers, etc. You can also get garment bags to carry on your shoulder. The overall quality and internal organization is still important but also the weight of the empty bag. Garment carriers can be heavy to carry with your clothing inside so look for durable lightweight material. Most garment bags without wheels offer some compartments for other personal belongings, like shoes and toiletries. However, the additional space is more limited due to weight restrictions, i.e. so not too heavy to carry. Garment bags no wheels are true to the main purpose of luggage garment bags, i.e. to protect your formal attire when travelling. Check out below B for Bag selection of garment bags on Amazon.